We may be called, “Aurora Exterior Painting” but that doesn’t mean we only paint exteriors! Whatever your painting needs, Aurora can cover them all with exceptional speed and quality. 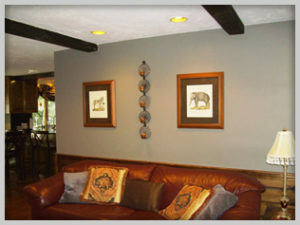 Aurora’s experienced crews will take exceptional care of your home while painting the interior. Drop cloths, plastic covers, blue tape are all used in assuring your home is protected while painting is being performed. Walls, ceilings, trim, windows and doors and all the necessary prep work are all handled professionally by the staff at Aurora. Water damage or holes in sheetrock? No problem. Our crews can make repairs to whatever your house may need. We can also install crown moldings to give your house exceptional detail. We use only top quality products to ensure your home gets the best job possible.